Here I’m going to argue for what I believe is an unused potential from a free international curriculum. The content would include a mix of videos, audio and books and cover lessons from the whole primary and secondary school years. The potential then comes from the equal chance everyone can have at improving their education. 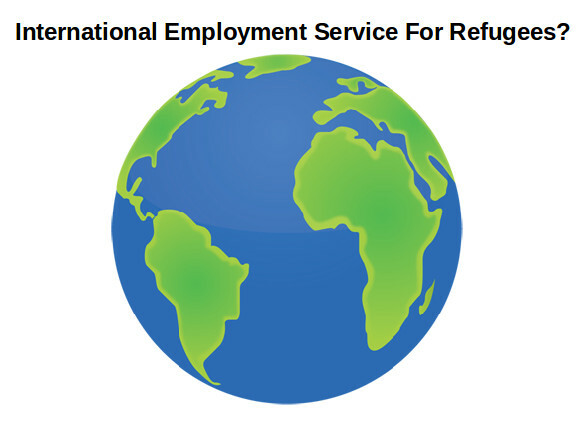 From adult learners that have missed out on education to refugees who can not go to school. The content should have an appropriate creative commons license so that it can be improved upon and translated. You should be able to have the content running without an internet connection. Because the offline option increases greatly the number of places where the curriculum can be deployed or reduces the cost of internet traffic. Even if there is a national curricula an international curricula with the best teachers could benefit the student greatly. For instance one can have web sites where students can pose their questions any time of the day. 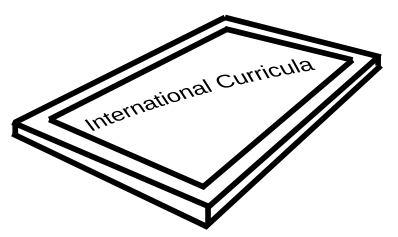 Here many people have the exact knowledge of the international curricula. 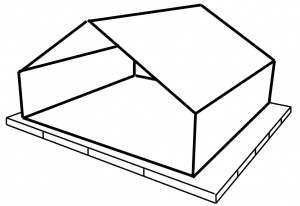 Have just tested an idea to make drawing easier. 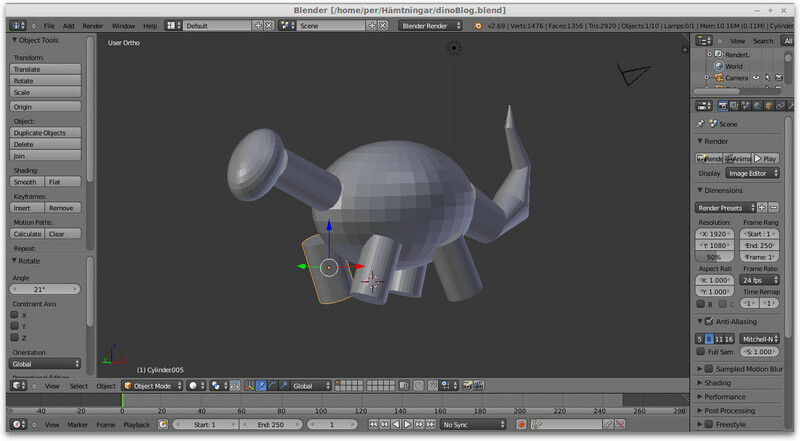 Basically I used the 3D software Blender to make a simple model of what I was going to draw. 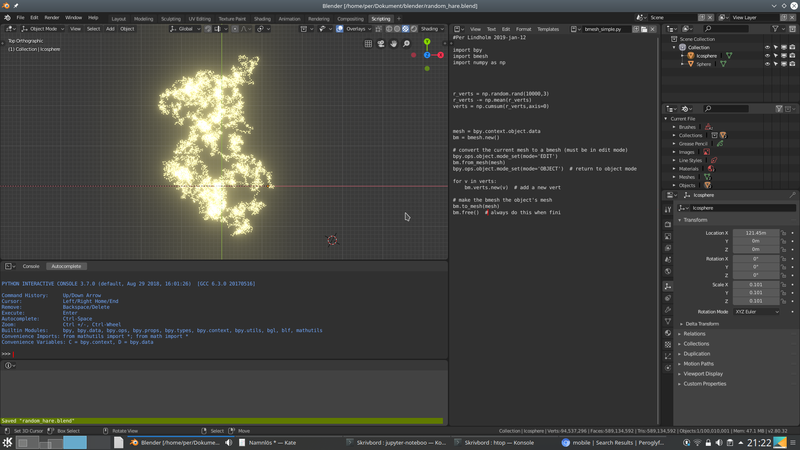 The model as in the screenshot below consists only of primitives and is very crude. First I thought of using an armature in the software but this was unnecessary. Just move and rotate the various body parts. Since I’m not trained at all in drawing I just put a piece of paper over screen and begin following contours. Then it was easy just to correct the drawing. 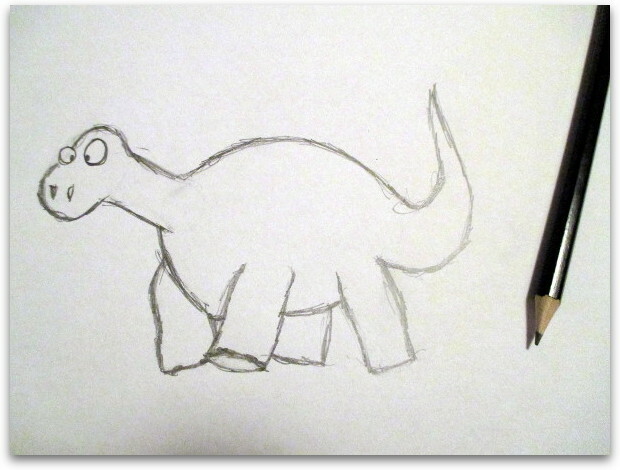 Blender 3D assisted sketch of the dino. Underlining or marking text is something you usually do for a test. However I thought why not take advantage of this for ordinary text on the Internet. E-books, news and blogs. Here there is no problem of having both a plain black text version or one that has markings. The idea is then to let the author mark key words or sentences that are important. Then the reader can turn on those markings optionally . To get a faster overview or to help him remember better. 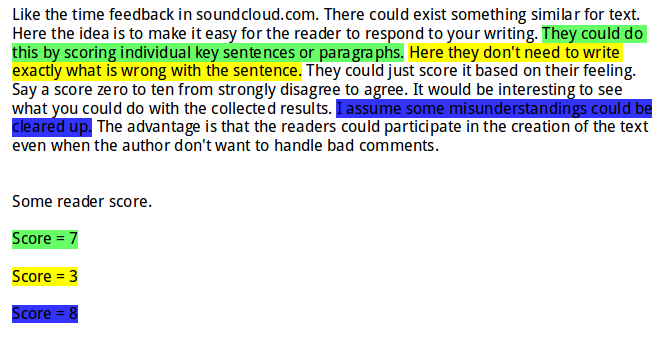 A related idea would be to let the reader turn on and off the color of the in-text hyperlinks in wikipedia articles. Otherwise it would look distracting when reading. Inspired by solar powered schools maybe there should be something similar like a solar powered distance work facility. 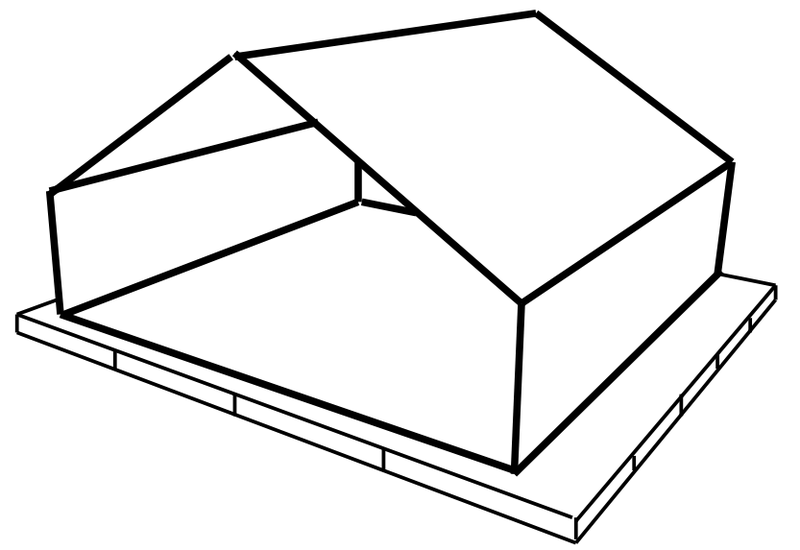 I wrote about such buildings in a previous blog post, http://peroglyfer.se/?p=413 . Here people can take on various distance jobs over the Internet. Since there is more focus on programming in school these days. Maybe teaching programming online could work. I thought it might be a good idea if such an opportunity could be offered to refugees. It so happens that there is a MOOC course on www.coursera.org starting on October 6 that could help. The name of the course is ”Programming for Everybody (Python)”. As the author Charles Severance points out. One of his goals is to teach you how to teach. 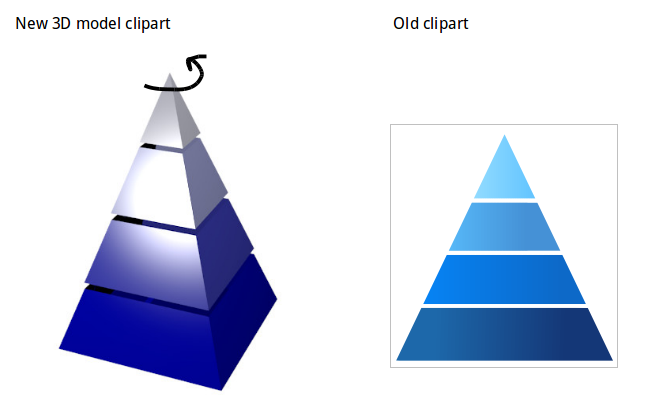 The material is also available under a creative commons license on http://open.umich.edu/education/si/coursera-programming-everybody/winter2014 . Like the time feedback in soundcloud.com. There could exist something similar for text. Here the idea is to make it easy for the reader to respond to your writing. They could do this by scoring individual key sentences or paragraphs. Here they don’t need to write exactly what is wrong with the sentence. They could just score it based on their feeling. Say a score zero to ten from strongly disagree to agree. It would be interesting to see what you could do with the collected results. I assume some misunderstandings could be cleared up. The advantage is that the readers could participate in the creation of the text even when the author don’t want to handle bad comments. In this blog post I’m going to present some example guesses of innovation using the technique described in ‘Innovation from a Google Search String’. I will start with the clock. Rewriting the invention to mean a point clock. A point clock is what I mean by a ordinary clock. It measures time at a point in space. I can then change the first word to get 3D clock. 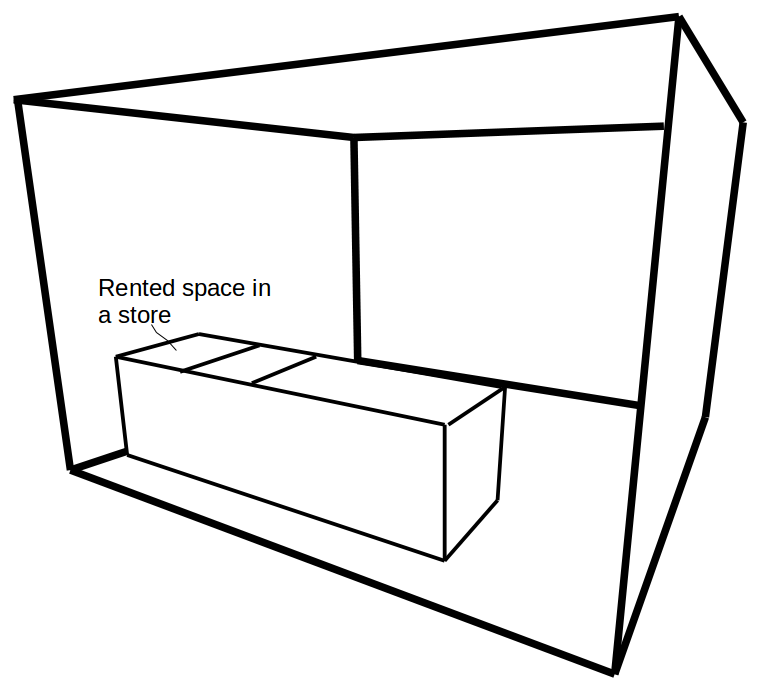 Then I will guess if a 3D clock makes some sense. If you have a number of very good clocks maybe there is the possibility that they will diverge from each other. If there is some disturbance that makes the clock show different time. 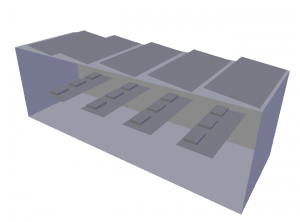 So a 3D clock could be a number of very accurate clocks placed in a lattice waiting to detect a disturbance and its shape. Similarly I’m going to try to innovate boiling. Looking at a water boiler and stove I can see that ordinary boiling means heating from a surface. 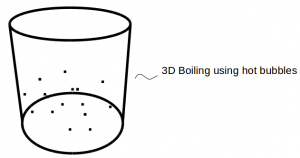 Rewriting boiling to mean 2D boiling. 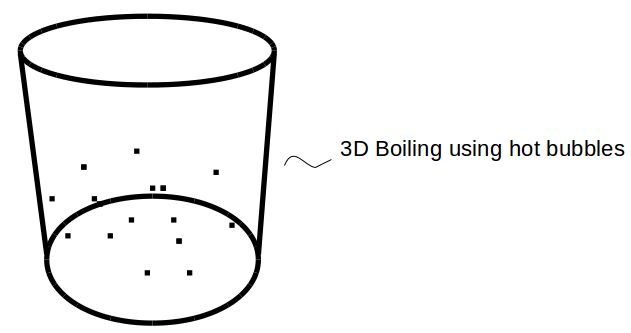 I just change that to 3D boiling. 3D could mean that there are a lot of heating points scattered throughout the water. Could I then heat the water more rapidly by using many hot air bubbles or hot water vapor bubbles? 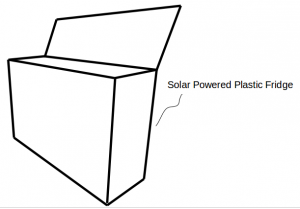 With the development of solar power there are new ultra efficient products available. However those are not always affordable for those who really need them. As an attempt to better the living standards for a lot of people. 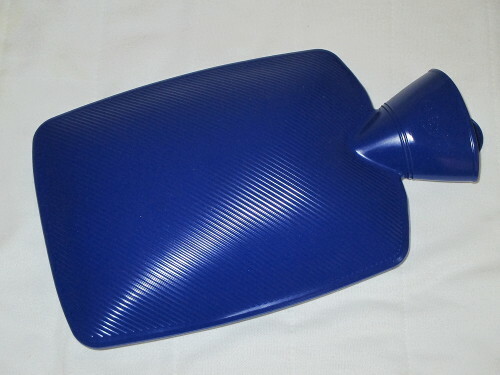 Is it possible to develop a lightweight but durable cheap cooling container made with plastic? I think it makes sense because second hand refrigerators could be harmful to the environment. I think I found an easy way to think about innovations. All inventions have names that describe them. If the names were very complicated and long or unique then you would not be able to shortcut innovation. However this is not the case. Many inventions can be described with just a couple of words. Take the microwave oven. Just add or change the words to something that could work. Like a “fan-assisted oven”. What has this to do with the Google search string? The way it is constructed. You find what you want by searching using just a few words, not complete sentences. After some practice you can start making predictions. Change a series of words describing an invention and see if that has already been discovered. It does not have to be inventions. Innovation could be about other things. Like types of strategies. Rewriting strategy to mean “human strategies”. I can guess the following just changing the first word to mean all living organisms. I assume then that for any living organism to survive in this complex world it has got an evolved strategy. Then the success of this organism would depend on how well the strategy works and how close to the strategy you are. There are many different solutions and features included for solar powered lights these days. Some of them include a radio but most include the usual cell phone charger and the LED lights. 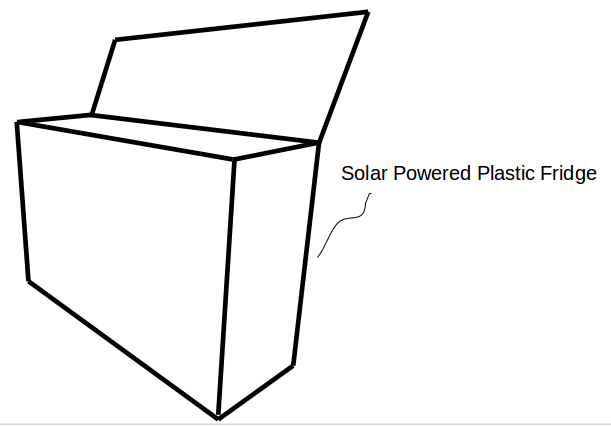 One of the most promising feature though I believe would be the development of a combined solar lantern and a wifi hotspot. The idea was to have a connection to the Internet by 3G. To this idea I would like to add the possibility of offline content. What if you can fit the whole school curriculum in the form of a digital content server onto these lanterns or solar kits. Streaming videos would be done by wifi directly from the device. No Internet required. With this you get the IT benefits right away before there is a Internet connection available in your price range. Another idea would be to have a wifi TV server. Where the device picks up the TV signal and streams the channels over the wifi to your phone or tablet. On a further note. I believe one can make something of an emergency communications station with the solar wifi lantern. Inspired by the goTenna. It should be possible to add a low frequency long range antenna to the lantern and connect it to the phone through wifi. Communication is done with text messages on a built in web server. With this you should be able to connect two or more lanterns from friends and family and also get information from the government. If a goal of distance working is to be environmentally friendly. Meaning less car travel. And working from home is not suited for everyone maybe there is an intermediate solution. 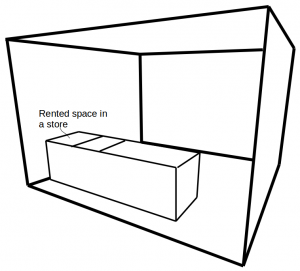 The idea is among the buildings close to home companies can rent space for distance workers. The facility would support and cooperate around IT, maintenance and other resources. This way productivity can be maintained with much less travel. You have probably experienced bad home LED-lights. Those with a blueish cold eye straining color. Therefor I wonder if you can add optimized LED back light that would produce a text on screen experience that is pleasant to look at. The back light does not need to produce light that shows the correct colors. Here the important thing is not put strain on the eyes when reading so maybe it can be a shade of a single color or a warm light. The idea is then to toggle to this mode if you are planning to read a longer period of time on your tablet or feel a strain on your the eyes. I would like to put forward an idea to further the access to education. There exists a fantastic offline compilation named RACHEL from www.worldpossible.org. It is a large collection of good educational content. It includes Wikipedia for Schools, Khan Academy, Science videos, Healthcare and Medicine videos, CK-12 Textbooks, World Literature Ebooks and much more. If its possible, the idea is to deliver cheap mobiles preloaded with the 32 GB RACHEL compilation. For developing nations I think it could make a difference. It may be naive but I would be so happy if some version of this could be distributed with the cheap Firefox OS phone in a way that complies with the license. Thinking about this further. For those who only have one smartphone it could be wise to have dual sd-card slots. With this you could then copy RACHEL easily from one card to another. Inspired by the computer of my childhood, the Amiga. I thought why are there no editors that have really nice graphics. If there were maybe more young people would take up programming as a hobby. 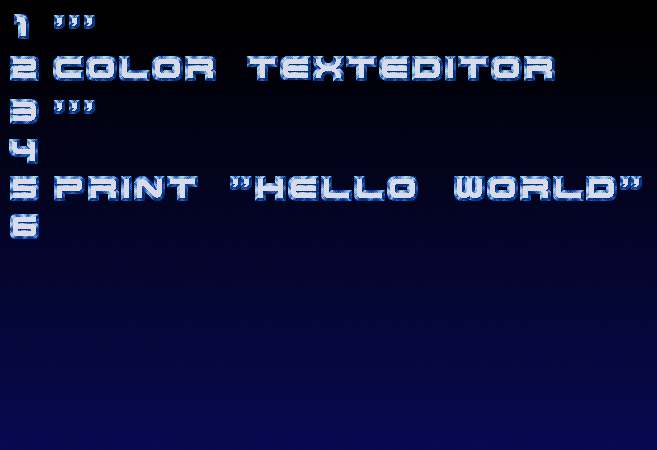 This example uses multicolor fonts but I am sure one can do a lot more to make the text editor inspiring.